The story begins, however, with an attempted suicide in a cheap railway hotel as Joschi is discovered unconscious by the owner who’d entered the room because Joschi had only paid for two hours, not knowing it would take longer than that to die. Three women huddle around his hospital bed side, meeting for the first time; one the mother of his son, Gabor, the other two pregnant with his children. Gabor, Hannah and Marika get together to share what they know about their father. He was born in Hungary, was Jewish and spent the last part of the war as a prisoner in Buchenwald; his first wife and their two children died in Auschwitz. Other than that there are only stories and nobody knows how much of those stories are true. As the siblings reminisce what little certainty there is comes into question. How can they be sure of anything? Was Joschi really Jewish at all, and if he wasn’t, why have they been told he was? Sixteen years old Lily, Marika’s daughter, narrates the story. She’s never met Joschi but she’s heard plenty of stories about him from her mother and her Aunt Hannah. Gabor hasn’t seen his half sisters for thirty years. Now in his early sixties, he’s an unmarried safety tester of childrens’ soft toys and should be a figure of ridicule, a tragic-comic character; Lily likes him for his quirks, rather than in spite of them. Hannah is also single but trying her hardest not to be; she’s an experience dater of Jewish men, leaving no Avi untried in her quest to find the one. Marika is an ex-punk who’s never really outgrown her rebellious streak. When the three of them start to argue about Joschi, strait-laced Gabor tells Marika how disappointed he was that she didn’t take the safety pin out of her ear for their father’s funeral. Susann Pasztor’s debut novel A Fabulous Liar is brilliantly funny but also very moving; it reminded me very much of Jonathan Safran Foer’s ‘Everything is Illuminated’, which tackles a similar subject, in the way that it uses memorably unique characters to allow humour to be injected into what is a difficult theme. The joke is not that Joschi could have done something as shocking as lying about having been a prisoner in Buchenwald; the laughs come from the realities that his children – second generation victims as they are known – have built around their family history and how they believe it has shaped their own characters. Hannah in particular has projected onto herself those traits she believes are typical of the children of holocaust survivors in a way that is as funny as it is sad. I found this idea that the sisters consider the possibility that Joschi’s story is untrue not in terms of how it changes their perception of their father, but in their own view of themselves really fascinating. A Fabulous Liar has a ‘coming of age’ feel about it in that we are now grown up enough to look back on the Holocaust and question at least elements of that history. Marika and Hannah both describe their school time experiences as second generation Holocaust victims saying that it was almost a passport to special treatment. Perhaps I’m wrong but I feel that this is a novel that could not have been written say twenty years ago because even then it would have been unthinkable to question the testimony of someone who claimed to have been held in a concentration camp. This is not to say that the subject isn’t treated with the appropriate gravity: indeed, I found Lily’s experience of visiting Buchenwald quite moving but I liked the way she wanted just to wander wherever the fancy took her, taking in the atmosphere, rather than following a designated route through the camp and diligently reading information boards. This is a real bitter-sweet gem of a story made special by Pasztor’s colourful characters and comic observations. In spite of the sadness of the occasion and the bickering of the siblings this is a fun family to spend time with but although the humour borders on the farcical at times, Pasztor never loses sight of the more shadowy aspects of the story. The outcome will not please all readers, I’m sure, but I love how the characters are able to find peace with themselves and with each other in spite of their differences. 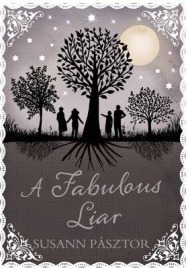 A Fabulous Liar is an immensely enjoyable and accomplished debut novel. The characters and settings have that quirky feel that I love in modern European fiction and it’s great to find that the translation doesn’t stifle that refreshing voice. I think this is a novel that would translate well to the big screen but in the meantime I recommend it to fans of intelligent contemporary fiction. With thanks to the publisher for the review copy sent. No Comments on "A Fabulous Liar"